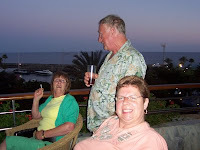 We've had yet another trip, this time to Anfi, Gran Canaria. 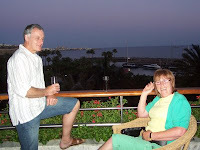 It was hastily arranged as we had decided not to go to Anfi this year but after discovering flight prices had dropped by two thirds...well, how could we refuse? 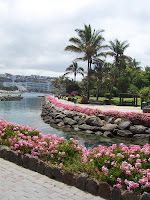 We were so glad to return to wonderful Anfi and meet up with old friends, bask in the sunshine and enjoy walks in the beautiful gardens that make Anfi so becoming. Opposite the reception entrance is the start of a public footpath fro m where a breathtaking view of Anfi island and marina can be seen. The island is heart shaped and a romantic gesture by the original founder of Anfi, Bjorn Lyng (now deceased). 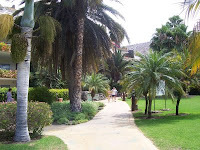 In front of the island is Anfi Plaza and a stage surrounded by palm trees for night time entertainment. 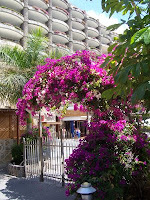 Our path down to the beach area took us through dappled shade, exotic plants and bougainvillea. 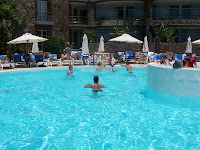 From here we could enjoy beautiful scenery and admire the colours and landscape of Anfi. 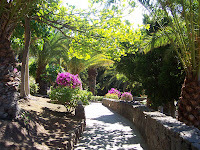 Natural stone features in Anfi gardens. Walls, paths and even seating areas are constructed from stone. Guanches, the original people of Gran Canaria used to live in caves and some of them still do, though modern caves are very tasteful with every mod con. I like to think of visitors to Anfi as being cave dwellers because thats basically what the apartments are, even though they are man made and beautifully inspired and well deserve their high rating status. 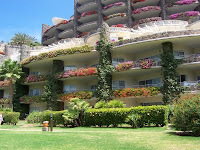 Our leisurely walk progressed into the mature gardens of Anfi Beach, where nature and stone combine and the pretty trailing geraniums on each apartment balcony adds a lovely accent of colour. 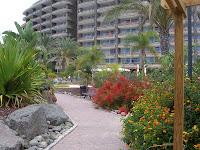 Anfi's team of gardeners keep the grounds perfectly groomed. 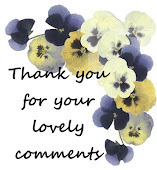 Thanks to their efforts it is a joy to walk alongside graceful palm trees, water features and flowering shrubs. 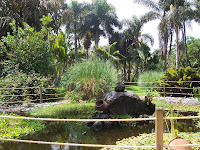 It is fun to watch out for native birds and lizards living comfortably at Anfi. Mosquitoes don't exist here...thank goodness! 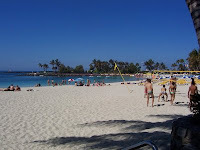 The beach at Anfi was created from sand imported from the Caribbean. It doesn't get hot, so bare feet are protected on this beach whatever the temperature. It is a favourite haunt for Anfi visitors and locals alike and the silver sand and azure blue sea and sky create a serene contrast of colours. 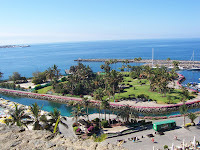 Anfi Plaza and the island. 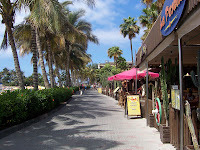 There are several restaurants to choose from at Anfi. This one is Mexican, where we enjoyed char-grilled chicken with Mexican sauce followed by ice cream desert. Other popular restaurants and bars surround the plaza area and entertainment stage. There is a craft market at the plaza every evening and I was thrilled to see a new stall this year. 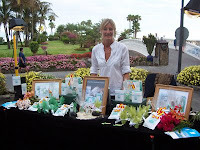 Alma de Canarias creates unique perfume made by Artisans in the Canaries. The stall, decorated with Bougainvillea, (one of the pe rfume ingredients) is the prettiest at the market and I treated myself to some perfume, perfectly described as a fresh sea breeze blended with citrus and melon. It really is lovely. 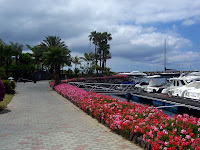 At last we made it to Anfi Island and marina where trailing geranium are in profusion. The water is clear and I have seen Sting Rays in the marina channel, burying themselves in the sand, along with brightly coloured crabs and fish in abundance. 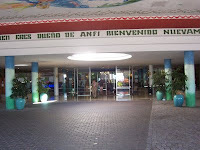 at Anfi. The seating just behind is so typical of stone sculptures at Anfi and one can imagine inspiration was drawn from a fairy-tale book. Crossing back from the island we returned to Puerto Anfi and made our way through gates heavily decorated with climbing Bougainvillea. 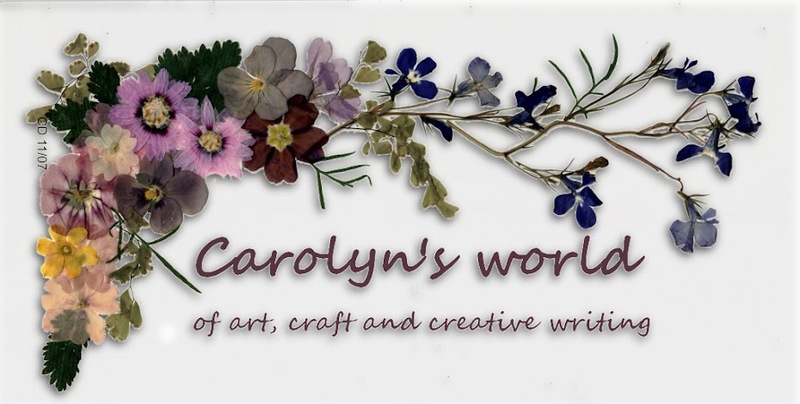 I love this adornment and its riot of pinks, reds and whites. My friends will be surprised to see who is beyond the gates at the centre of this photo. 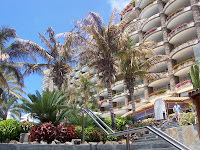 We made our way up the entrance stairs to Puerto, flanked on each side with colourful shrubs and inviting pathways which led to pools, apartments and then on to Gran Anfi. 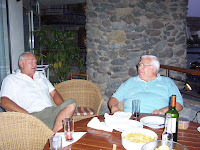 Our holidays at Anfi wouldn't be complete without meeting up with old friends and dining out. We had plenty of opportunities to do just that. Whether it was for a nightcap after evening entertainment or hosting a get-together in our apartment or meeting for lunch. Memorable dining includes an Indian meal at the Bahia where the onion bhajis deserve full marks for presentation. TheTropicana hosted a grand Canarian Buffet with traditional singers and dancers to mark National Canarian Day and it was amazing. I'm only sorry I didn't have my camera with me at the time. What an event! 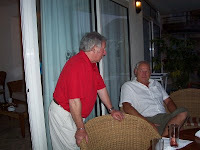 Ten of us gathered at our apartment one night and as is usually the case after dining, the men had their own round table on the balcony enjoying their comradeship while we women created our own circle in the lounge. 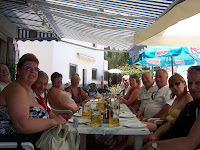 On the last da y of our holiday we all went out for lunch. to Arguineguin and had lunch al-fresco. 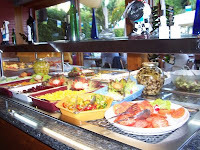 was had by all as we tucked into delicious tapas, locally caught fish and mouth watering steak. do you know is it possible to take the same photo like your second picture? I would like to take a picture from the heart shaped island but I don't have a room in that hotel that is too expensive for me, I would like only a picture with my boyfriend. You can take the same photo. The viewpoint is across the road from Monti Anfi reception. You also have access to the island if you want to take photos there. The most beautiful place where I was. I wish I was there.